“My oldest son graduated from the 8th grade last week. His father and I picked this particular school for its academic rigor. By the time his nine years there were up, my son had visited England, passed Algebra 2, read Virgil (in Latin), played Katherine in a full staging of Shakespeare’s Henry V, and drawn a map of Europe freehand, including mountain ranges and bodies of water, with only the latitude and longitude as guidelines. “We were ecstatic about his education and how well it prepared him for the future. “Though the school is ostensibly non-denominational, their crest does feature a cross. When my son inquired about it, he was informed that the cross represents all religions…. “A few days after my son’s graduation, we were sitting at the Friday night service of the congregation of my daughter’s school. I watched her sing and clap along with all the blessings, cover her eyes for the Shema, and turn to welcome the Shabbat Queen. My daughter was doing it all organically, nearly instinctively, and at utter ease. “I also watched my sons, trying to keep up with the service, always a beat behind with what everyone else was doing, and generally tuned out while the prayers were going on, staring up at the ceiling, eyes glazed over. 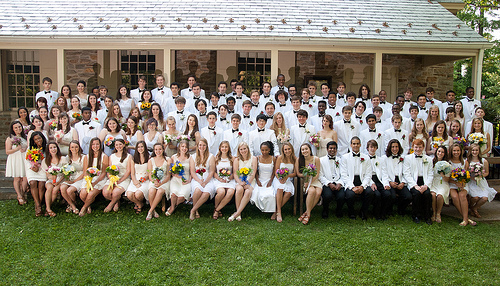 Last week I received an Email from the Alumni office of my alma mater, the Friends School of Baltimore, containing a photograph from this year’s 109 new graduates. Like Alina Adams’ sons, I attended an excellent school, a school where I learned to work hard and to be curious about the world and to value the importance of expressing my own Jenny-Ann-Freedman voice. 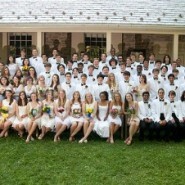 But looking at this year’s graduates sitting as I did 24 years ago for the final group photo in front of the school’s Quaker Meeting House, tears sprang to my eyes. Like the “cross representing all religions,” I too never saw Quakerism as a type of Christianity. It was a hippy, pacifist, come-as-you-are religion where a religiously and politically liberal Jew like me felt very, very at home. And looking at this photo, I know that there are at least a minyan or two of Jewish kids sitting in front of that meeting house who feel so much more at home there than they ever have at a shul. Jewish kids who, like Jenny Ann Freedman and Alina Adams’ sons today, are so far away that they don’t even have any clue where home is. I heard something unbelievable this week, but I did the math, and it’s actually true. If there was a human chain of all the generations of JewishMOMs leading back from me today to Mt. Sinai around 3300 years ago, there would only be around 100 of us. ONE HUNDRED of us. There would be Chana Jenny from Jerusalem. And Grandma Gladys from Baltimore. And Great-Grandma Chana from Queens. And Great-Great-Grandma Tilly from Manhattan. And Tilly’s JewishMOM, a Great-Great-Great Grandma from a town in Eastern Europe. I don’t know her name or her town’s name. But I know without a doubt that she passed down Shabbat and Mikve and Kosher and love of Torah and a connection with Hashem to her daughter because she had received it from her mother who had received it from her mother and she from her mother before her, all the way back 3300 years to the day Hashem revealed himself to the Jewish people at Mt. Sinai. And just imagine, just imagine, JewishMOM, if all 100 of us JewishMOMs could squish together into my Nachlaot living room together today! My mom and her mom and her mom and her mom and her mom…. I wonder what all we JewishMOMs would do as we sat there together for that first time…Would we cry with joy over all the children who after so many millenia are still living as Jews, against all odds? Or would cry with grief over all the multitudes of lost Jewish boys and girls who are not? Hi JewishMom. I love your postings but I’m not sure about your logic. A generation is not based on the length of life but the age at giving birth. Divide not by 70 years but by 20, 25 or maybe 30. My mum gave birth to me when she was 23. Her Mum was 25 when my mum was born. Actually, the length of a generation is from when you are born until when your children are born. So there are about 100 generations from Har Sinai until now. (That’s a round number, but works out ok since 33 is somewhere in the middle of the childbearing years). Never mind the math — no matter how many generations we’re talking about, the fact of the matter is that we’re losing our future generations. It’s in the hands of JewishMoms to fix that. I enjoy reading your posts. This one hits home. I was provided with a public school education and no Jewish education, and yet I was drawn to observance. My children attend public school too. They’ve been attending a Hebrew school as well but the quality of the program is low. Our Orthodox rabbi as well as countless friends have attempted to convince us that yeshiva is where we should be sending our children to school. Here a huge issue : cost. The outlandish tens of thousands of dollars it costs to send a child to yeshiva is making the decision easy. If it didn’t cost so much, I’d consider it. And while we discuss this topic, another point that must be brought to light is that there a Jewish couples deciding to have fewer children so that they can afford tuition for yeshiva. This goes against what G-D wants from us, what previous Jewish moms wanted for us, what my relatives in Holocaust died for…and yet I know of dozens of families in my shul that have two or three kids and consciously stopped having more solely because of the cost of yeshiva. Hmmm. Oh, but what about scholarships, you say? A generous thousand or two, or even three is a tiny dent in schooling that will continue for twelve years. Multiply that by multiple children, add a mortgage, feed (kosher costs more!) & clothe everyone. Yeshiva prices are not conducive to having children. So very ironic. Interesting how the mother in the article has paid or is paying three private school tuitions, two not Jewish. The tragedy will be when her sons marry non-Jews, though with her own husband not Jewish, they probably won’t view it as a tragedy. I don’t think it is an either/or decision. Training in Torah does not leave one’s mind a mush. Perhaps remedial math and writing are needed for many but that can come later and in a less threatening environment. Just because one pursues a college education and earns a degree (or two) is no guarantee of income or satisfaction in life. Our priority should be to raise the next generation of Jews connected to Hashem and His Torah. But Naomi, our boys are smart enough to learn that on their own without devoting hours and hours to it each day in school… and they make it- be it as a rabbi or businessman or whatever profession. But, without a Torah education, our kids won’t even marry a Jew chas v’sholom, never mind observe Torah and Mitzvot in the home. Maybe some boys make it without the formal secular education, but for many it is a struggle, if not downright impossible. when i see a Jewish school that deviates from “one size fits all” by letting kids find their natural skills (music, sports, art etc) i want to shout “hurray, kol ha kavod and yasher koach all at once.